In today’s expanding marketing landscape—not to mention today’s increasingly complex matrix known as the customer journey—the chief marketing officer is faced with sheer and unadulterated chaos. From the multiplying channels that our customers are defining as their most valued to the massive amounts of customer data and intelligence flooding (i.e., clogging) our analytics and intelligence systems, CMOs must wrangle and tame the complexity in order to make better decisions faster and have true visibility and transparency into performance, outcomes and value to the business. 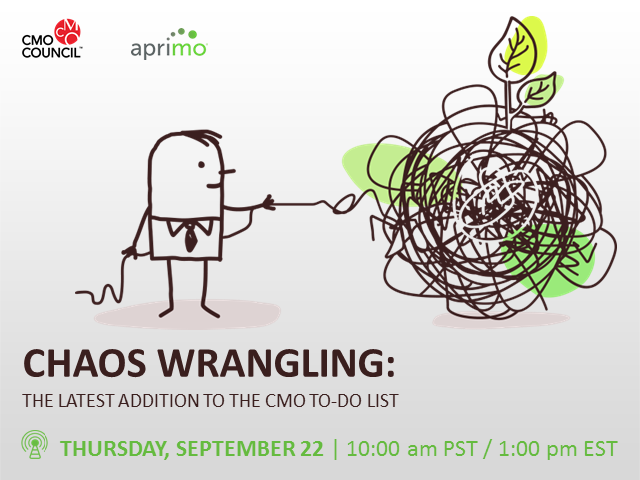 Joining the CMO Council for this best-practice dialogue will be brand leaders who are transforming the chaos across the organization, as well as marketing operations experts who will share examples of where and how transformation can help tame the chaos and turn it into a profitable process.